14638-44 Vanowen, originally uploaded by here in van nuys. 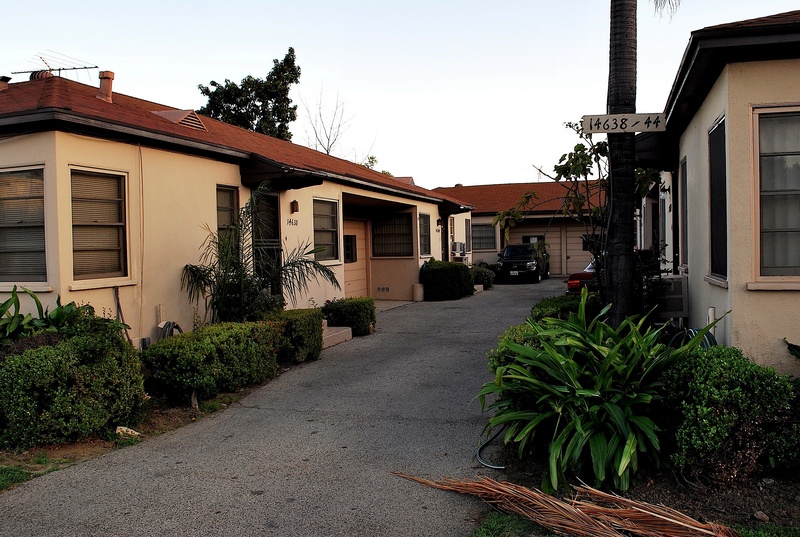 One of the older, quiet, one-story, multi-family buildings that still exist in Los Angeles…… and here in Van Nuys. They are modest. One doesn’t see the garish and decorative ornament that mars many buildings in L.A. They are only one-story tall, which allows an occupant to come outside and chat with the neighbors and enjoy the sunlight. They provide a modest cost way for newcomers to live in a civilized way while gaining a foothold in this city. They also might be suitable for single people, divorced parents with kids, and older people. Thousands of these have been destroyed in the last few years, especially in places like Studio City (near CBS). In their severe and straightforward style, they do not appeal to those who get their rocks off on “googie” coffee shops or Mid-Century modernism. But they have contributed, and continue to do a good job, of making people happy in little contained communities, in a city where novelty and alienation reign supreme.